We’re careering headlong towards Christmas, but we don’t want to be careering off the road at the same time. Because the twin hazards that face us at this time of year are the fact that a) the roads are becoming icy, plus b) the challenge of other drivers full of festive spirits(s) and the general excesses of the Christmas party season. A really simple, but effective one to start. The Council will no doubt be gritting the roads and it’s that kind of grit the can get kicked up by traffic and obscure a driver’s vision, so make sure you keep the windscreen wash topped up. Also, a great tip is to keep your vehicle consistently full of petrol or diesel. This is firstly so that you have plenty of fuel if you get stranded, or perhaps need to keep the engine going to stay warm. However, a full tank may also help prevent any residual water freezing in the fuel pump. Of course to the north of us in the UK, many Scandinavian countries require drivers to change to winter tyres as soon as winter approaches. While that is probably unnecessary beyond more remote, rural areas, all drivers should nevertheless keep a close eye on the pressure in the tyres of their cars. Pressures drop with the drop in the temperature and if you’re driving around in a car with low pressure in the tyres, you will find that it affects the control of the car, and will also begin to wear the tyres out. We have had some rather severe winters recently, and climate change campaigners will tell you winters are set to become even more harsh. We have seen roads cut off and drivers stranded and, while an extreme scenario, it may serve you well to consider keeping some useful items in your car during the winter months, especially if you live in more rural areas, or are planning journeys to more remote places to see friends and family. You can purchase such kits ready-made; equally, you may be able to assemble the items yourself, which should include: a blanket, a torch, a first-aid kit, de-icer, a spade to dig out snow, a phone charger that can run from the car battery and jump cables. Belt and braces, maybe, but better safe than sorry if the snow comes tumbling down! Obviously as winter truly sets in after Christmas, freezing temperatures are likely. And it’s then that we bear witness to the traditional suburban scene, in streets all over the UK: drivers at the front of their houses frantically trying to de-ice the windows and get their cars warmed up. As per point 1, make sure coolant levels are generous at this time of year, and consider adding water as well as antifreeze to the radiator in your car. 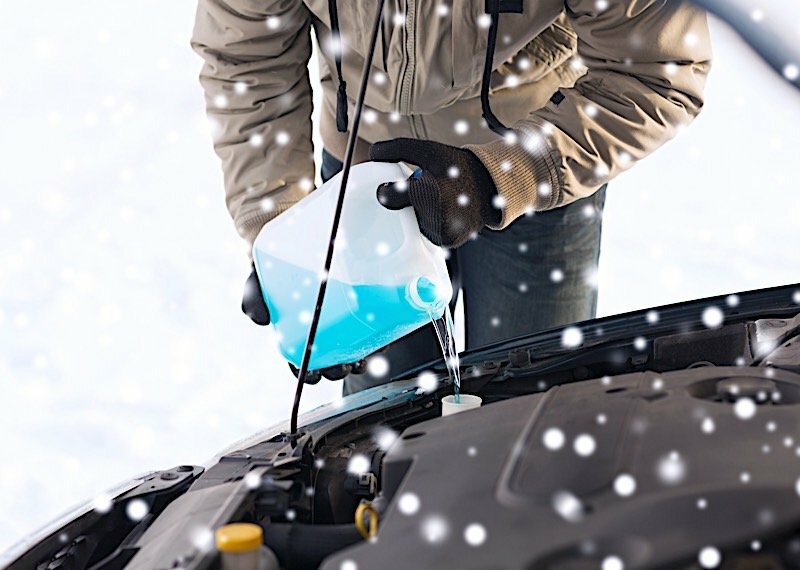 This can help by creating a lower freezing point for the engine, thereby helping it through these tricky weeks, when both cars (and their owners) are susceptible to the cold. Yes – its the sound of your car not starting! Like their owners, vehicles can find it harder to operate in the winter months. Their batteries can run down, as it’s harder for the battery to run in colder temperatures. This is especially true for diesel cars, that might need extra warming up in the mornings. So, get your battery tested at your local mechanics and if it’s looking enfeebled, then you are probably better off replacing it before the cold sets in, when a weaker battery will struggle to fire up. Take these simple tips on board, and you and your car will hopefully have a fabulous festive season. Alternatively, saddle your Peugeot to some reindeer and trust in the fuel of festive spirit!